Posted on November 13, 2018 - Get free updates of new posts here. This article originally appeared as a guest post on Smart Insights. Have you ever looked at your website analytics in real-time and watched as people entered the site? To your excitement, some of them filled out a form and converted into a lead. I have, and it’s awesome seeing the 5-6% of people that make it through your website funnel pop out the other end. But what about the 94-95% of people who don’t convert? Most likely you’ve got a remarketing campaign setup which is bringing some of them back. But is there anything else you can do? The answer is yes. And in this article, i’ll show you two ways to identify the visitors on your website who haven’t converted, and then what you can do with that data to take your B2B marketing to the next level. An IP (Internet Protocol) address is a unique label assigned to each device that’s connected to a computer network. It looks something like 111.70.248.127. For most individuals or smaller businesses, these IP addresses are assigned by their Internet Service Provider randomly. Larger companies, however, have their own dedicated IP addresses and this is where the opportunity lies. Using web tracking or specialist reverse IP mapping software, you can identify the IP address of visitors and then work out the name of these larger companies once they visit your website. As you can see, i’ve discovered that Toshiba Australia, Area 9 IT Solutions and a bunch of other companies have visited the website in the past week – all companies who never converted and who I never would have known about. There’s a lot of tools that you can use to reverse-IP lookup companies, and some that do it in real-time such as Clearbit Reveal. There’s also tools that allow you to chat with identified visitors, push them into your CRM system as opportunities, tools that let you cold email drip campaigns and a lot of other functionality available. 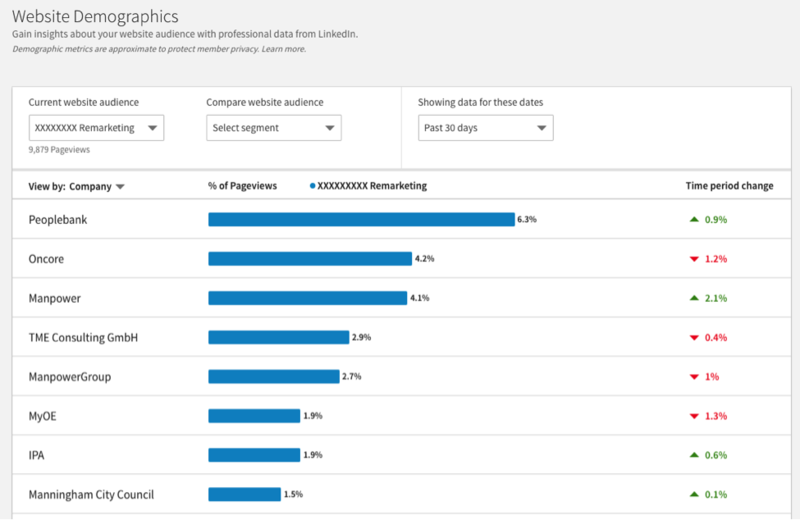 Another way to identify which B2B prospects are browsing your website and reading your content but who have not converted is LinkedIn Website Demographics. 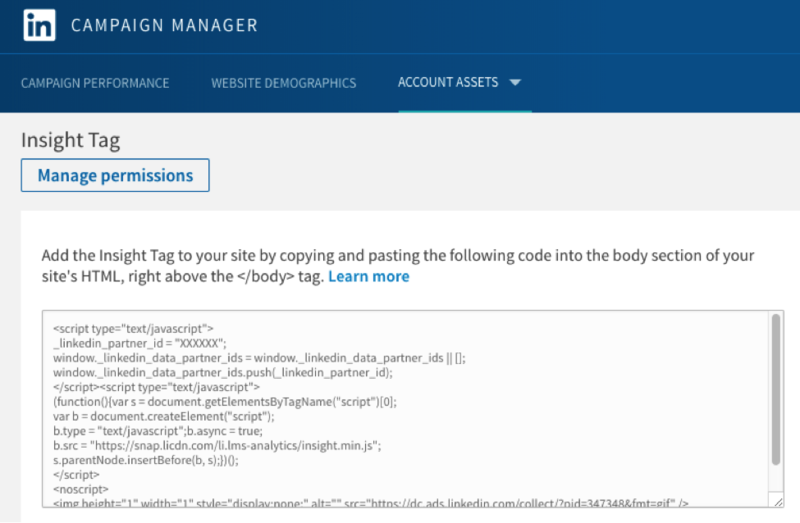 To enable this tracking, you’ll need to setup a LinkedIn Ads account and then navigate to the Insight Tag and install it on your website. As you can see Peoplebank, Oncore, Manpower and a bunch of other companies have visited the website. Some may be customers already, some might be trying to sell me something or do research, but a lot of them will be old and new prospects. LinkedIn limits how many companies they show so if you have a high traffic website select a custom date and go through manually day by day copying each companies name into a master file so that you pick up as many you can. If you want to drill down on certain parts of your website and see which companies are visiting that part of the site — for example a specific campaign landing page — then you can setup Website Segments and filter down. Through one or both methods you should now have a big (and growing) list of prospects who visited your site but didn’t convert. So what do you actually do with that list? B2B Companies Uncovered… Now What? 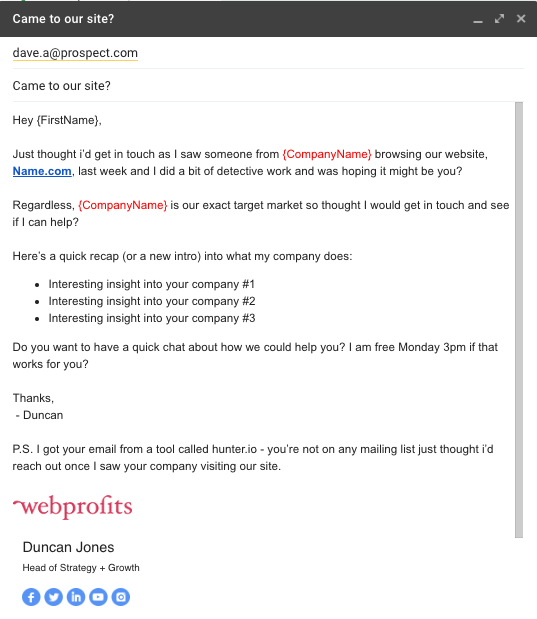 The first and easiest thing to do, is to get in touch with the companies you don’t know using sales outreach. You’ll only have their company name and some may be large, so you will have to work out who to contact at the company by trawling through LinkedIn and looking for the most likely person who was browsing your site, or who would consider buying your product. Worse case, you outreach to someone who wasn’t the person who came to your site, but is still in your target market! If you have big lists of companies browsing your site you can do all of the cold outreach in bulk from finding their email addresses to actually sending the individual emails out of your email account through a tool like Mailshake – you can even preset follow up emails which will go in bulk and only if the prospects does not reply. Make sure to measure and optimise these emails as you would any other campaign as the subject line and copy you use will matter to the end result. Don’t forget to also pick up the phone and call the prospects as well, perhaps as a follow up to the bulk email. The fact you saw someone on your website from their company is a great opener. 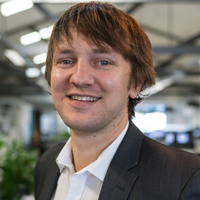 As you’re going through the list of companies visiting your website, you’re going to notice some names – old leads you dealt with in the past that didn’t close or people who you’ve been trying to close for years but haven’t managed to. 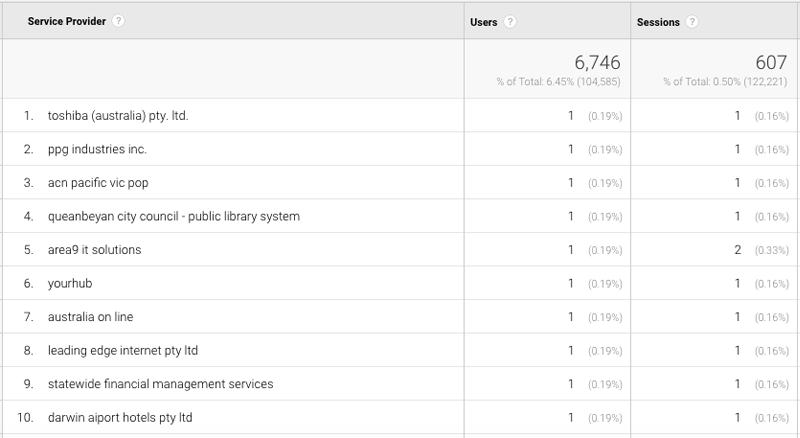 Knowing that people from these companies have visited your website again and may still be considering your product or services is great, and gives you another reason to engage with them. Call them, or communicate with them in any way that you can, and do it as fast as possible. Although you can use remarketing to target website visitors who don’t convert, this groups all website visitors into the same bucket. You will then spend your marketing budget evenly across this whole audience regardless regardless of how likely they are to convert. Instead of remarketing, you can utilise highly-targeted company focused ad campaigns. LinkedIn offers the ability to upload a list of companies as an audience and then target the with ad campaigns. To upload your list of target companies simply navigate to Account Assets > Uploaded list audiences and then select “Upload List” – here’s the format to use. You can then target this audience with any LinkedIn ads you want to run. You can also overlay other demographics so that you can target just people with the job title “Head of Digital” at each company in the list, for example. Facebook used to have a similar feature allowing you to target ads by employer but they have restricted this targeting significantly, so it’s better to stick to LinkedIn Ads until the feature (hopefully) comes back on Facebook. Other than LinkedIn Ads, a new startup Albacross have a platform which shows who has come to your website and then allows you to market to specific people through banner ads which is worth checking out. Another longer-term method you can use to market to the B2B prospects visiting your site but not converting is website personalisation. Using the reverse-IP lookup method, you have their IP addresses. With those addresses, you can then personalise your website for those specific companies so that if and when they come back to your website you can ensure it has the highest chance of converting them. If you have a lot of prospect companies you want to personalise your website for, it will take a lot of time to create each version, so look to group common or similar targets. Trigger a personalised chat-bot sequence that speaks directly to those companies and shortcuts them to the right part of your chat-bot straight away. Customising your website based on IP address is actually relatively easy for most website builds, so it’s worth testing. There are also a lot of tools that can help you do this. One to check out is Intellimize which can be combined with Hull.io for powerful personalisation based on IP address (both past visitors you’ve identified and future ones based on their IP lists). 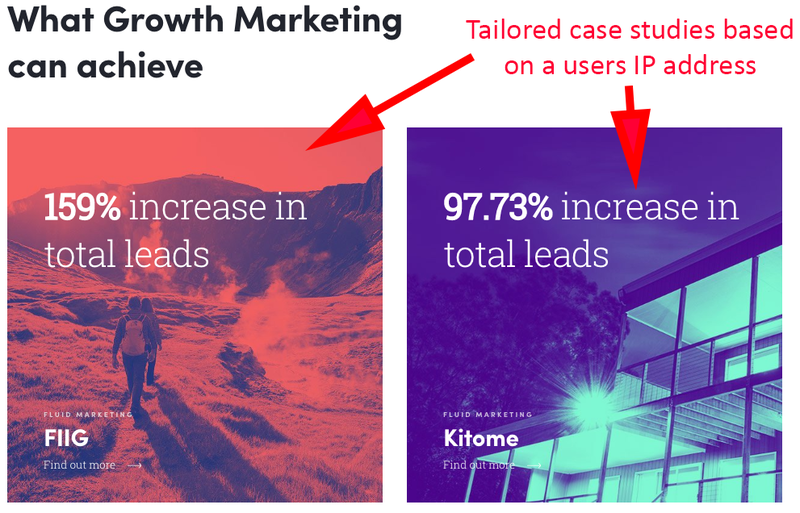 Identifying who is using your website and isn’t converting, and then marketing and selling to them via outreach or other account-based selling methods is a lot of work. But the benefits can be significant. You’ve spent the money on marketing to these B2B prospects, and getting them to your website and they’re now warm prospects who know your brand and may just need a slight push to take the next step – much easier than marketing to brand-new prospects all the time. I am happy I came across your article as converting B2B warm (!) leads has been a real struggle for us here, at Nightwatch.io. LinkedIn Website Demographic will be my focus for this week hoping that I can gain some valuable insights from it… Actually never heard of it. Thanks, Duncan, glad to see juicy and full of useful information articles among all this marketing buzz we see every day! Thanks for your comment Kas – great to hear you got value out of the article. You should also look at implementing a sales-assistance automated email sequence to help your sales team close the leads. In order to use LinkedIn Website Demographic, do I need to have a minimum ad expense per month on LinkedIn Ads? Hey Gilbert – the great news is you don’t have to spend $1 – you can just setup an Ad Account and install the tag but then never go ahead and launch a campaign if you don’t want.